Assam State Public Finance Institutional Reforms Recruitment 2018 : A new Assam government job notification is out recently. According to this latest Assam Govt. Job , The State Project Director (SPD), Assam State Public Finance Institutional Reforms(ASPIRe) invites applications to fill up IT personnel to be termed as Senior Software Developer for carrying out certain upgrades in the exiting existing CTMIS, under DOAT to cope up with the changes & challenges faced in the IT field while delivering the services to the stakeholders by the treasuries. We shall discuss more about this government job below. 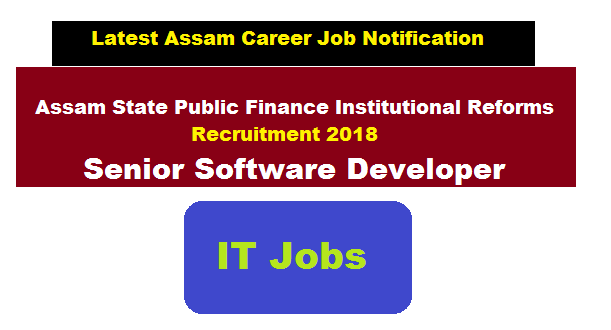 In this section, we will discuss in detail about Recruitment of Senior Software Developer Under Assam State Public Finance Institutional Reforms with all the details and requirements . Following are the details of the post under Assam State Public Finance Reforms Recruitment 2018 with required qualification, age limit, salary and every details. Optional : Knowledge of open source software . Salary : The remuneration would be not be more than 6 lakhs per annum i.e 50000 per month. The selection committee will prepare a short list of candidates for each of the positions on the basis of their past experience of handling similar types of projects/ assignments, educational background, technical strength and domain knowledge. Only short listed candidates will be called for the personal interview. The Last Date of receipt of application: 30/06/2018.